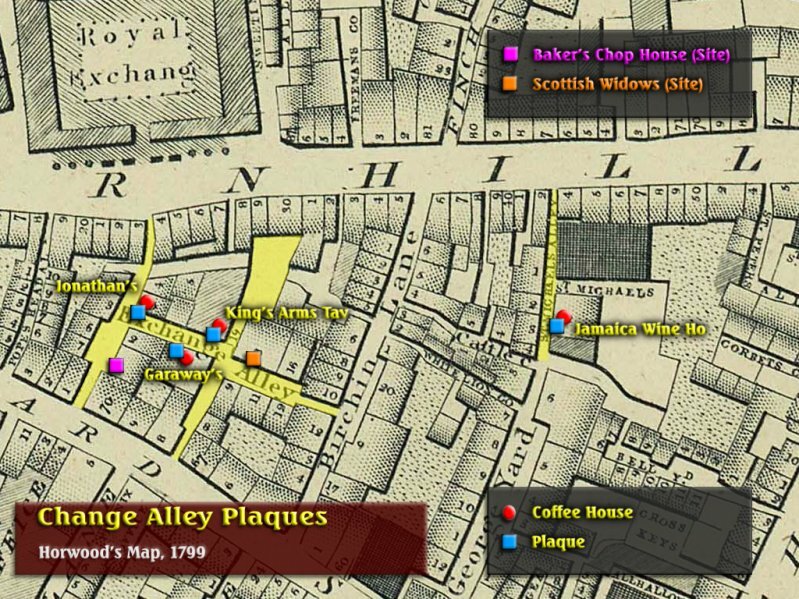 A map and some brief notes on the history of some of the important Coffee Houses in the City of London in the 17th century. Coffee and hot drinking chocolate were the new drinks which sratred to appear in special shops in the 1650s. 1744 • The company had been meeting in the Maryland Coffee House, at No 58 Threadneedle Street, near the Royal Exchange. In 1744 it was renamed the ‘Virginia and Baltic Coffee House’. It was from this coffee house, usually just called the ‘Baltic Coffee House’ that the Baltic Exchange began. 1810 • Due to an increase in business the company moved to larger premises at the Antwerp Tavern, also in Threadneedle Street. 1823 • To combat ‘wild gambling’ in the market and establish some regulation, a committee of senior coffee house regulators was formed. Rules were devised and an admission procedure was developed. A private meeting room was established, to which admission was strictly controlled. This was the start of the Modern Baltic market. 1656 • Thomas Garraway was the first man to sell tea in the City, which cost between £0.80 and £2.50 Sterling per pound in weight. This and Jonathan’s both stood in Change Alley, off Lombard Street. Garraway's was primarily the haunt of merchants and medical men. 1666 • Monday 3 September • It was destroyed in the Great Fire. 1748 • The building burnt down in a fire on Cornhill in March 1748. 1872 • It finally closed as a coffee house. In 1874 a bank was erected on the site. The present building, which had been a bank, was erected 1930. 1652 • Coffee was first sold from a tent erected in St Michael's churchyard making it the first place in London where coffee was sold to the public. A building was later erected and the owner was a Ragusan named ‘Pasqua Rosee’ which means ‘Easter Rose’. Ragusa is a town in Sicily. It opened at the ‘Sign of my own head’. 1666 • Monday 3 September • Only opened in 1652, it was destroyed in the Great Fire. 1676 • After the Great Fire it was rebuilt under the name of the Jamaica Coffee House. It was then used by traders with the West Indies. Now • The premises, in use as a wine bar, are on the W side of St Michael's Alley, which runs S from Cornhill. 1677 • 9 July • It was established. Jonothan’s stood at No 20 Change Alley, off Lombard Street. Jonathan’s stood next to Garraway's. 1698 • It was the rendezvous of the stockbrokers who, ousted from the Royal Exchange in 1698 by the merchants, came to this coffee house before taking up new offices in the Stock Exchange in Capel Court. Jonothan’s and Garraway’s became the site of Martin’s Bank. 1688 • Edward Lloyd began running a coffee house in Great Tower Street. 1692 • He moved his Coffee House from Great Tower Street to Lombard Street. Men with shipping and trading interests visited the coffee house. Lloyd used to paste shipping news on the walls of his premises because such information was not given in newspapers. He later brought out ‘Lloyd’s News’ for the same purpose. At a time when communications were unreliable, Lloyd gained an enviable reputation for trustworthy shipping news. This was crucial to successful underwriting and ensured that ‘Lloyds’ became recognised as the place for obtaining marine insurance. 1713 • Edward Lloyd died. 1734 • ‘Lloyd’s News’ was replaced with ‘Lloyd’s List’. It has remained the authoritative bulletin on shipping ever since. 1770 • The insurance company moved from Lombard Street, into the Royal Exchange.